Back to 1962 with US Astronaut John Glenn's Stopwatch: Piloting an F1 racing car or a sailing boat in the America's Cup requires precision instruments of the highest calibre. How about when piloting a spaceship? An independent researcher has presented conclusive evidence that US astronaut John Glenn was wearing a Heuer stopwatch when he piloted the Mercury-Atlas 6 "Friendship 7" spacecraft on the first manned U.S. orbital mission. This means that Heuer now named TAG Heuer was the first Swiss watchmaker in space! Prior to Glenn's historic flight, the only watch to pass beyond the stratosphere was the Russian-made chronograph that Yuri Gagarin wore when he orbited the earth in 1961. The evidence, presented by space and watch enthusiast Jeff Stein, is based on flight records and NASA documents and several archival photographs. The stopwatch, a "standard Heuer stopwatch, Reference 2915A," with 12-hour capacity and 1/5 second accuracy, was fitted with elastic bands to be secured onto the sleeve of Glenn's spacesuit. It is now owned by the Smithsonian Institute and currently on display at the San Diego Air and Space Museum. Stein includes this quote from the display: "After the failure of other brands on the earlier flights of Alan Shepherd and Virgil "Gus" Grissom, the TAG Heuer was selected by NASA due to its ability to withstand the high G-forces created by liftoff." The launch from "Cape Canaveral" later renamed for President Kennedy, in Florida on February 22, 1962, saw John Glenn successfully orbit the earth three times, reaching a maximum altitude of approximately 162 miles and an orbital velocity of approximately 17,500 miles per hour. The mission lasted almost five hours, requiring the use of Heuer's well-proven 12-hour timer. According to Stein, the Heuer stopwatch strapped to Glenn's wrist over his space suit served as the "backup clock" for the flight. "Measuring time has been a critical factor in men's journeys into space," writes Stein, "as it was also critical in man's early journeys across the oceans or the continents by railroad. Whether executing precise maneuvers or navigating the journey, it has been critical for space travelers to be able to time events and to know the time of day (in a realm in which there are no days). Conditions demand timepieces that will be rugged, reliable and precise, and easy to read and operate." "I am happy to introduce the TAG Heuer name -- with its rich history and reputation in sports and scientific timing -- into this discussion (or perhaps we should call it the "space race"), and to present the information and images that I have gathered," writes Stein on his excellent vintage Heuer website - OnTheDash.com. John Glenn's adaptation of a Heuer stopwatch allowed him to keep time reliably with the utmost accuracy throughout the flight. Today, the astronaut would have no shortage of high-quality TAG Heuer chronographs to choose from! Today the brand is also famous for creating avant-garde movements, housing these in leading-edge chronograph cases, and equipping them with highly flexible bracelets of unparalleled durability, comfort and elegance. The leading maker of precision-driven sports watches and chronographs since 1860, TAG Heuer is grateful to Jeff Stein for his research and proud to be associated with John Glenn's historic achievement. Gee... that's pretty cool, but looking at the close ups of his watch in the article, it looks more like it was preset to the 15 second mark than the 20 second. By the way, which watch was worn by Alan Shepard? Shepard probably didn't wear a watch as there really weren't any time critical elements to his ballistic flight, like time to retro fire. On the question of whether Shepard and Grissom wore watches during their flights (stopwatches, watches or chronographs), I have studied a lot of photos, and it seems fairly certain that they were NOT wearing watches on their Mercury flights. Backup clocks are also not mentioned in the transcripts for their flights. The watches are clear in the Glenn, Carpenter and Schirra photos, but missing from the Shepard and Grissom photos. There is a mistake on the Tag Heuer site and in the article. Gagarin was not wearing a chronograph into space. It was a handwound Sturmanskie with central seconds complication and a hacking feature that allowed the watch to be precisely stopped and synchronized with a given time signal. The Sturmanskie Gagarin wore into space had a highly finished (including Geneva striping!) 17 jewel, shock protected movement. The movement was housed in a chrome plated, two-piece case measuring 33 mm across, 12 mm high, with a 16 mm lug size and had a stainless steel screw back. I'd like to learn more about the Sturmanskie brand. I haven't found any website talking about it on the web, even on Russian times. Does anyone have a good resource about it? John Glenn wore a stopwatch on his right wrist, during the MA-6 mission. I think it was a Heuer. Anybody out there with any more info? Well I have Gagarin's watch. Not the flown one but a "Commander's" watch issued by Chistopol watch factory and awarded to Gagarin 1965 by Kuznetsov, Head of Cosmonaut Training. Gagarin obviously had enough watches as next year he gave it to his brother. It is inscribed "To brother Boris. Yu. A Gagarin, 1966". Not sure if he ever wore it (a photo would be a fantastic find), nor am I sure if it has any intrinsic value as a watch but it's certainly a prized possession. I heard that Scott Carpenter asked Breitling to make a 24 hour version of the navitimer. Anybody know anything about this? I first saw photos of it dated Nov. 1961. It would be an interesting topic, if someone wanted to write about it. Indeed Carpenter did fly with a modified Breitling Navitimer with a 24-hour movement dubbed the "Cosmonaute". I have corresponded with Scott and Kris about this timepiece some time ago in an effort to find its' whereabouts. Unfortunately, Scott's chronograph was submerged in seawater during his recovery and was not very watertight. It was returned to Breitling for repair following the flight and, in a nice gesture, they replaced it with a pristine model. Of course, today his flown watch would be very valuable, but that was not appreciated at the time. He was happy to get a replacement. The original has never been seen again, even after efforts by Breitling to track it down recently. Scott didn't have too much luck with his personal gear on MA-7...his Randall survival knife, engraved with his name, also went missing from his kit. Bo Randall ended up making him a new one of those, too. Two people somewhere in the world have some very nice flown items. Breitling still makes the Cosmonaute today, but don't be fooled. It has a completely different automatic movement, unlike the original hand-wound Venus his had. At one time, they were fitted with a Lemania-based movement similar, if not identical, to the 861 caliber Omega Speedmasters. I'd look for one of those if I were shopping for one. Takes a little time to get used to looking at a 24-hour dial, after recognizing the hand positions on a standard one all your life. Ah, yes. The Breitling. Speaking of which, can anyone identify this watch, visible in the foreground on Carpenter's left wrist? Is it a Bulova Accutron? Who is that little girl in the background? (ha-ha-ha). Could it be someone we heard of on cS? More importantly, what's for lunch? Sandwiches and Fritos? Great eyes, Lou- that certainly is a Bulova Accutron, considering the content of this page, most especially. Yes. I asked the Dynamic Pioneer™ on Saturday morning. It was a Bulova Accutron, which he thought he might still own. He smiled remembering the circumstances, recalling that it was Gordo who brought the watch to Project Mercury in exchange for a semi-formal endorsement of the Accutron. "Gordo got kinda mad at me," Carpenter explained, because his endorsement of the watch wasn't wholehearted enough at some point for Bulova's purposes. It was a nice watch, he said: "one of the first" with a quartz movement (or something). The problem was, as far as the DP was concerned, that the Bulova used "a little tuning fork." With that watch still on his wrist, beneath his pillow at night, trying to get to sleep, Carpenter could hear the little tuning fork. It was a little noisy for one Mercury astronaut's comfort. Do you have any pics of DP wearing the Breitling? As an owner (the Datora, not the Cosmonaut) and enthusiast, I occasionally visit the Breitling forums and this topic comes up every now and then. Kevin, there are a few images, but not anything like those of the Accutron. Recall that he received the reconfigured Breitling Navitimer just a few days before his flight--so on perhaps one of the Bill Taub photographs of Carpenter's capsule ingress on May 24, 1962, you can see the watch around his space-suited wrist. You can also see what I assume is the Breitling around his wrist for his postflight arrival at Patrick AFB. But he returned it to Breitling HQ to fix some water damage in the week or so after his flight. The story he tells is that Breitling sent him a replacement watch, named the Cosmonaute. What I believe to be the first flown watch,* therefore, may be in a vault somewhere. The question is where, and whose vault? It likely has a serial number that would date its manufacture to some time in April or May 1962. Breitling has changed hands since 1962. *By "flown" I mean flown in US orbital spaceflight at the very least. Glenn wore no watch. Did Shepard or Grissom wear watches on their suborbital flights? Does anyone know? 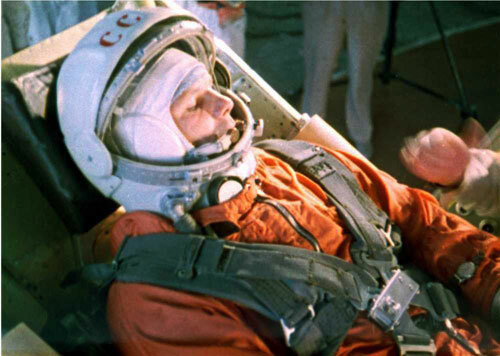 Did Gagarin or Titov wear watches? AFAIK, Carpenter is the first documented wearer of a timepiece, a Breitling timepiece, in space. I think the research confirms that Shepard and Grissom did not wear watches on their flight. Carpenter wears the Breitling and then Schirra wears the Omega Speedmaster for MA-8. Cooper wears the Speedmaster and also brings along an Bulova Accutron on MA-9. NASA does their watch testing between the end of Mercury and the beginning of Gemini. Gemini 3 is the first crew to be issued the venerable Omega Speedmaster as standard equipment. Brock is right on the money there. KC... you may remember that you and I exchanged some emails last year, and I ended up sitting next to a Breitling VP on a flight one night. We talked about this subject for a long time, and he got interested in looking into it. Well, he went to the big annual watch show at Basel, and was met with alot of shoulder shrugs and funny looks. If there were such a vault, it was likely cleaned out long ago during one of the mergers/buyouts. Breitling disassembled the watch for cleaning and perhaps testing. Breitling disassembled the watch and, not recognizing its' historic importance, returned parts or the whole watch to stock. Someone at Breitling retained the watch as a personal momento and it remains in private (and very quiet) hands today. I think the likelyhood of seeing it publicly again ranks right up there with finding Buzz's Speedmaster. But, if the owner(s) of said timepieces happens to be a lurker here, I welcome the opportunity to be proven wrong. As an aside, Bulova has announced that they no longer produce replacement parts for the old tuning fork Accutron, so if anyone plans on acquiring one of these, beware that it may have a very limited lifespan. The current Accutron Astronaut, which ironically, Buzz endorsed and allowed the use of his signature on the case, is fitted with a modern quartz movement and date window. Thanks, Brock and 328KF, for advancing the story. And, yes, 328, I well remember our excellent correspondence about the Breitling. It's a fascinating story. In fact, I saved the notes I took for you during my informal interview with Carpenter and was able to share them with Rolex researcher, Jake Ehrlich, who has been pursuing another watch mystery. Listen to the podcast here (also linked on ScottCarpenter.com) of Jake's September 2008 interview with Carpenter. Although his primary interest was the Rolex Sea-Dweller (he publishes some nice photos of Carpenter's Sea-Dweller), you can hear the audio of the two men discussing (among other things) the development of the Breitling for spaceflight and the likely fate of the flown watch after its May 1962 journey. Now, there is a watch just exactly like I want here in Boulder. It is stainless steel, non-magnetic, shockproof, waterproof, dustproof, and has a sweep second hand, minute hand, hour hand, and numbers that are coated with radium so that they shine at night... [on page 2, closing] I will repeat, I would like to have a watch that is everything-proof plus a radiumated sweepsecond hand and minute and hour hand. Then I can tell the zero hour at night to the very second. I'm curious. What could this watch possibly be? Young Carpenter tells his father he saw it at a Boulder jeweler's store. C.U. Boulder was then awash with military officers training on campus, creating a demand for high-performance watches. What watch would a jeweler carry in order to meet this insatiable demand? About the Accutron. After posting that LIFE magazine photograph and hearing cSers chime in on the scene, I thought to add more information about the setting of the lunch scene, since a lot of this is mid-20th-century cultural history (folkways). I walked home this April day in 1962 from my first-grade classroom to have lunch with my dad, home from the Cape for a rare visit. Yes, those are Fritos. We are probably having bologna sandwiches with Miracle Whip and iceberg lettuce leaves. [[Oh, and on edit, how could I possibly forget the slabs of Velveeta that my mother added to this unforgettable midday meal?]] 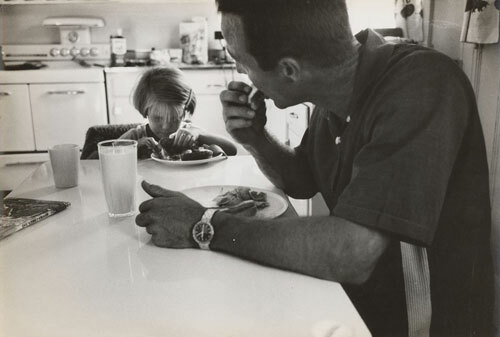 Ralph Morse, the photographer, has captured me copying my dad, who was in the habit of inserting several Fritos into his sandwich. I'm putting Fritos into my sandwich, just like my dad. This scene is the kitchen of the Carpenter home on Eagan Street which was lined with identical houses that comprised officers housing at Langley Air Force Base, Virginia. The Coopers lived next door and likely had an identical kitchen. It was an amazing place to be a kid. About the Accutron, I remember often asking to hear the tuning fork in my dad's watch. It was a really interesting sound. I had no idea how it worked, or why. But it was pretty cool. The Rolex blog is a great site with lots of pictures...I really think that "Space Dweller" is kind of cool! I will have to listen to Scott's interview later this evening. "Rolex has also been the choice of NASA Astronauts to be worn on the Moon, on the Space Shuttle and onboard the International Space Station." I don't where they got that from, but otherwise a great discussion of your Dad's influence in these fine watch designs as he pursued the exploration of multiple frontiers. I would also note that near the end of the article, he shows a cropped pic of Cooper and Conrad on the ship after GT-5. He says that Cooper had converted to the Speedmaster by that point in his career. On the contrary, both GT-5 crewmen wore both the Omegas and their own personal Bulova Accutrons. So it would appear that Cooper had convinced several of the Mercury/Gemini guys to try the Bulova. Conrad wore it once more, along with two Speedmasters, on GT-11. You can never have too many watches in space, I guess. The only other time I saw The Accutron used on a space mission was, believe it or not, in 1983, when Norm Thagard wore his on STS-7. Thanks, Kris, for taking the time to share some of this amazing history with us. Thanks, 328. I read your post with interest. About Jake's photograph of the vintage Breitling, posted on his blog, I myself did not supply it and can't vouch for its accuracy and of course have no expertise in the matter. The only photographs we Carpenters have of the reconfigured Breitling Navitimer are those taken by chance--and by chance showing his left wrist--by NASA photographers in the days before and just after the flight. I think the only Carpenter-supplied watch photographs in the blog linked upthread are those of the Sea-Dweller--still trying to nail down the date it came into Carpenter's possession. He linked it with Sealab II. 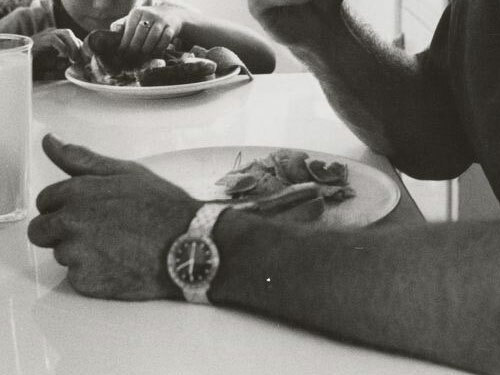 But, interestingly, it appears that on the Rolex blog Dee O'Hara is suggesting (in her inscription of that photo with Carpenter) that Carpenter is showing her his new Breitling! The Navitimer "Cosmonaute" performed flawlessly during Aurora 7 with the exception of a the seawater damaging the movement during the recovery phase. Of all the watch brands out there I think that Breitling is the most closely associated with aviation/aerospace. If I remember correctiy NASA selected several chronographs from different brands bought of the shelf at Corrigan's Jewelers in Houston. I think we know that Omega, Rolex and Longines were part of the competition. However I don't think Breitling was part of the testing. Anyone care to comment on this? I would find it odd that after Carpenter wore the Navitimer on his flight NASA never chose to test that brand. The story of NASA cooking, dunking, shaking, freezing these watches is a story in and of itself. Kris, I imagine that at one time or another your father wore an Omega Speedmaster given to him by NASA. If that is the case I was wondering what his thoughts were on the Speedmaster compared to his Navitimer and other watches he owned. Kris, you mentioned your father wanting a really tough watch in 1943. I am guessing that the Hamilton Watch Company was all the rage during WW2. It has a rightfully proud history of supplying watches to the services during the war. Hamilton was everywhere in those days. Lots and lots of pilots in the USAAF wore Hamilton for their durability. A complete guess on my part. From: San Francisco, California, U.S.A.
328KF, thank you for sharing your kind words about my online Rolex History Magazine. You suggested my statement was "Inaccurate" when I said "Rolex has also been the choice of NASA Astronauts to be worn on the Moon, on the Space Shuttle and onboard the International Space Station." This is a fact and there is a great deal of direct evidence I dug up that comes directly from the NASA archive to support this. You can find links to the Rolex watch Moon stories which I included in my article and interview I did with Scott Carpenter. It is a fact on Apollo 14 that Dr. Edgar Mitchell and Stuart Roosa wore Rolex GMT's to and on the moon. Also Alan Shepard of Apollo 14 wore a Rolex GMT. Jack Swigert wore a Rolex GMT on Apollo 13. This is a well established fact, but Omega fans typically don't recognize this? Many other NASA Astronauts wore Rolex watches including Wally Schirra, and John Glenn. Even Wernher von Braun wore a Rolex, not an Omega. I have nothing against Omega, but I believe as you will soon learn things were definitely not what they appeared to be. It is also a fact Rolex has been worn on many Space Shuttle missions and on the International Space Station by many NASA Astronauts including Commander and Dr. Leroy Chaio who I wrote an article about and did a podcast interview with which you can also find a link to in Scott Carpenter's article. You also said "I may be wrong, but it looks like the vintage Cosmonaut pictured has "Scott Carpenter" photoshopped into it." I don't know for certain. I found the images on the web and simply included them for historical reference. Scott Carpenter told me the story about the Breitling watches. I don't know anything about Breitling, except that John Travolta is in many magazine adds for Breitling that look super-photoshopped to me. As far as the pic of Cooper and Conrad on the ship after GT-5, I simply repeated the story as it had been relayed to me by Scott's daughter, Kris. I don't know anything about Bulova Accutron watches either, except that Elvis wore one on a black leather wristband in his 1968 comeback special concert. Despite being passionate about timeless Rolex design, my only objective is to find and publish the truth about watches in Space and I have gone to great lengths to do so. I think the Omega Speedmaster Professional Moonwatch is a cool watch and it was the official choice of NASA, but many of the NASA astronauts personally chose Rolex for obvious reasons. Omega is the "Official" James Bond watch today because Omega was willing to "pay" to make it so and Rolex refused, despite the fact Ian Flemming wrote that it was Rolex in the original James Bond novel. Same thing in my mind with NASA. Somebody at NASA got paid to make the choice of Omega over Rolex -- just like with James Bond. I have heard and explored the stories about NASA going to the Houston Jewelry store and the supposed tests, but it appears as if that was fabricated as an urban legend. I have a pretty rock-solid expert witness who will remain anonymous for now who tells me Omega "paid" to be the official watch just like they did with James Bond. I have a pretty rock-solid expert witness who will remain anonymous for now who tells me Omega "paid" to be the official watch just like they did with James Bond. Like yourself, I take pride in collectSPACE treating history with the respect. Exceptional claims require exceptional evidence, so I would encourage your witness to step forward. Regarding Mitchell's use of the Rolex on the surface of the Moon, do you plan to interview him as you have Scott Carpenter? The photos you present paint the picture that the Rolex flew on the mission, but I do not know if we can go so far as to say it was on his wrist while out on the surface. As to Rolex being "the" choice of NASA astronauts, I would respectfully suggest it may certainly have been "a" choice, but not the only one (or even perhaps the most popular). I know quite a few former astronauts who span the Apollo to ISS programs who continue to wear Omegas, not because they are paid to, but because they prefer the Speedmaster. My expert source is rock-solid and they have already gone on the record with me in a podcast interview which I have not published yet. Yes I plan to interview Dr. Edgar Mitchell as I have Scott Carpenter. I have seen significant evidence that suggests Dr. Mitchell wore his Rolex on the longest moonwalk in history and I will be sharing it in a future article I am working on. On Jake's Rolex Watch Blog I say "Rolex has also been the choice of NASA Astronauts to be worn on the Moon, on the Space Shuttle and aboard the International Space Station." I said this and I stand behind it 100%. It is an indisputable fact that Rolex has flown on the Space Shuttle and the International Space Station. From the research I have done it appears as if the Rolex watch and Omega watch communities are littered with misinformation and made-up stories. My intention is to separate the fact from the fiction -- once and for all. Thanks, Brock, for the additional information on the Breitling and for your thoughts about the ubiquity of the Hamilton watch in World War II service. I hope to follow up with my father on Monday regarding some of these watch identifications and will alert him to the good questions raised in this thread. Jake, as I stated, your article was a great read. I certainly look forward to seeing what you come up with in the future, and please do keep us posted here. Harold Johnson, one of the STG engineers, came to our office one day with eight wristwatches-one for each of us and one he would wear. They were analog watches with numbered dials, but the numbers went from one to twenty-four. Six o'clock in the morning appeared as three to anyone who had used an everyday watch; noon was six, and midnight twelve. Johnson said we'd better become accustomed to these watches, because the world-wide tracking network was soon to go on twenty-four hour time. They were confusing to say the least. They were also completely unnecessary, since on our spacecraft clocks we would be reading digital time, as would the flight director and his crew in Mercury Control. The seven of us, by the numbers, unstrapped the Johnson watches, as we called them, and placed them on our desks. We would not wear them, and that was that. There was no discussion, and Johnson beat a hasty retreat. 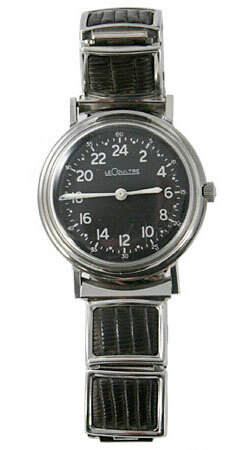 LeCoultre wristwatch with 24 hour dial & lizard & metal wrist band worn by Schirra during his early Mercury 7 training. Excellent working condition. Letter of authenticity signed by Wally Schirra indicating that this came from his personal space collection. (1994 Cert by Wally Schirra). I had a chance on Monday to discuss the Breitling (and other) watches with my dad, after showing him this interesting thread. He had a couple of reactions. I'll relate them in no particular order and apologize in advance for any repetition of information supplied in previous posts. This was his ca. October 2008 recollection reacting to this cS thread, which contains some new information. Carpenter smiled and said, "I forgot that John wore that stopwatch," when we looked at the TAG Heuer link with its great pictures. He disagreed with the interpretation of the transcript, which at 00 00 23 has Glenn discussing the backup clock. He says Glenn is not referencing his stopwatch. Carpenter also smiled to hear me read aloud Wally's written account of "the Johnson watch" and saw the beautiful picture of the Le Coultre watch posted upthread and said aloud "La COLT-er." Not squinting to see the small type. Then Carpenter tried to explain that communication and navigation were his specific responsibilities for Project Mercury. Timekeeping was an essential subset of these. So when he met the RAAF pilots who introduced him to their Breitling Navitimers in September 1961, when he was in Muchea for MA-4, he took the initiative to write to Breitling, telling Breitling that timekeeping was his specific responsibility and toward this end he wanted the reconfigured Navitimer to retain the circular slide rule and to delete the tachymeter in order to make room for the 24-hour dial. Carpenter concedes that he proceeded in this direction without developing a consensus among the 7. "I held my ground maybe in defiance of the pressure of the group but in the belief I was right." What was the design principle involved in the 24-hour dial, I asked? "NASA needed to conform its practices," he explained, "to the ways of the future and anticipate the pressures exerted by changing technology" in the environment of space. My sense was, at root, Carpenter believes that pilots "want to be able to say what they read. Nowhere on a 12-hour dial," he finally expressed with satisfaction, "does it say '8 PM'." The photograph of him and Dee O'Hara, Carpenter says, is right before his flight at the Cape. And he is showing Dee his Breitling, he says. He remembers that the one they sent him did say "Cosmonaute" on the face. This name presented a bit of an ideological affront, he recalls, given cold war tensions but he reasoned that Breitling was just being "European." And I wonder now, as an aside, that this francophone linguistic faux pas on Breitling's part may have cost them the NASA contract. I mean, they could have made Cosmonaute 24-hour and 12-hour versions of the watch in an effort to appease the 12-hour dial aficionados. Most importantly, they could have named it The Astronaut. About the WWII Hamilton, Carpenter said he couldn't remember the brand, but Hamilton "sounded right." "It was a big American watch," he said. "A regular chronometer with a radiumated sweep second hand." Oh, and the timing of the Carpenter in Muchea contact with the Navitimer preceded by about three weeks GIlruth's announcement to the 7 that Glenn-Carpenter would be the prime-alternate team for the first US manned orbital flight. That took place on October 4, 1961, in Langley. This is the great part of being on this forum. Thanks for that Kris! 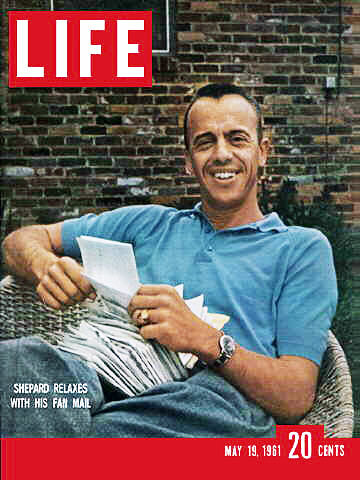 I found this image of Alan Shepard on the cover of Life on May 19, 1961 just after he got back from his Mercury flight. It appears as if he is wearing the LeCoultre 24 Hour watch just like Schirra's. That photo of the "vintage" Cosmonaut is definitely photoshopped. The "Scott Carpenter" certainly has been added, probably in place of the AOPA wings that Breitling was using in that period (see the advert a bit higher in the blog). The problem with identifying these early ones is that some had the wings, some had the "B" logo, some said Navitimer, some said Cosmonaut, and others had both (or neither!). As for Breitling's association with aviation, it wasn't until the original Navitimer came out that the company started pushing that angle and the flying public made the association. Sure, their previous watches were useful to aviators, but have you ever tried to use that slide rule in-flight? Eek. Interesting that Carpenter had them delete the tachymeter for the 24-hour dial because the Speedmaster retained the tachymeter instead of something like the sliderule, which again is nice, but really not practical, especially for gloved hands. One last bit. I would be stunned to see definitive documentation that NASA (or someone at NASA) was paid off to use the Speedmaster. I have spoken with many of the Crew Systems Division people, including some who were in charge of the area responsible for stuff like watches. I would find it highly questionable if someone suggested they were somehow paid or forced to use a particular brand. In fact, I have documentation to the contrary. Correspondence from the Astronaut office, under Deke Slayton's signature, details what happened. According to him, 4 Speedies were procured in October 1964 for astronaut (non-flight) use. In April 1965, he recommended that "we purchase only the Omega Speedmaster," because, for one "It is unanimously preferred by all astronauts over all chronographs that have been used throught the Mercury and Gemini programs... [it] was also highly preferred by the GT-3 and GT-4 crews who participated in an operational evaluation of chronographs (Omega Speedmaster, Rolex GMT Master, Longine Wittnauer 235T) which met the basic configuration requirements as specified in an RFQ distributed to all known watch manufacturers on September 24, 1964." Note that he didn't include Breitling in his final list, probably because of the lack of water resistance as mentioned. As you can see, the Rolex wasn't as popular as the blog might suggest, at least for "preflight training and during Gemini missions" as Slayton describes. He goes on with a detailed comparison, noting that the Speedy was more accurate, readable under all light conditions, easy to wind with spacesuit gloves on, more reliable, and performed better in environmental testing. He knocked the Rolex for being impossible to wind with gloves on, it stopped running under various tests, and the hands warped during the environmental tests. The Longines popped its crystal (ironically, so did the Speedy during one of the Apollo missions, as I recall). He concludes, "An extensive investigation of all domestic and foreign chronographs revealed that the Omega Speedmaster Model No. 6049 best satisfies the above requirement, and is the only chronograph tested that definitely does not cause a possible hazard to flight safety during both normal and emergency space flight environmental conditions." Slayton recommended buying 17 watches to start from J. Lechenger Jeweler, Inc. of Houston for $82.50 each and getting stainless steel straps made by J.B. Champion from Levit's Jewelers, also of Houston. I have no idea if they actually went through with either of those purchases. For Apollo, Crew Systems initially contracted with Hamilton Standard Division (the prime suit contractor) to provide a wrist watch for the suit under the 9-3535 development contract, but deleted that provision in early 1965. All these documents are official NASA memos out of the National Archives in Ft. Worth. Seems like a lot of trouble to go through to make up that stuff if Omega just made a deal with the NASA administration (or whoever) to be the official watch company. So please, post the podcast or at least give us the name of your source. Kevin, I looked closely at the image you reference and I agree it looks photoshopped -- poorly, I might add. I did not catch this detail because I was so busy writing, and researching as you can imagine. When Scott Carpenter first told me about how Breitling made a Scott Carpenter Cosmonaut I was naturally curious and I went on the web to see what it looked like without the intention of including it in the article. I later added the two images for simple frame of reference. I wandered into this site where I sourced the image in controversy. After close examination, I have decided the image does not belong in Scott's article and I will remove it in the future. I will leave the image up for a week or two so that everybody has the ability to confirm that what I say is true. I would also like to address the issue of NASA being paid to use the Speedmaster. Before, I specifically address this issue I want to make something crystal clear. I like Rolex design very much, but as a historian I have no bias toward Rolex or any other brand. I am only committed to pursuing the truth. In the future, as previously mentioned, I will publish all my findings on this issue. I must say I was shocked when I went through the NASA archives and found photos of Apollo astronauts wearing Rolex watches to the moon including Jack Swigert, Edgar Mitchell and Stuart Roosa. I naturally sought to understand what all these Apollo Astronauts and more were doing wearing Rolex GMT's. 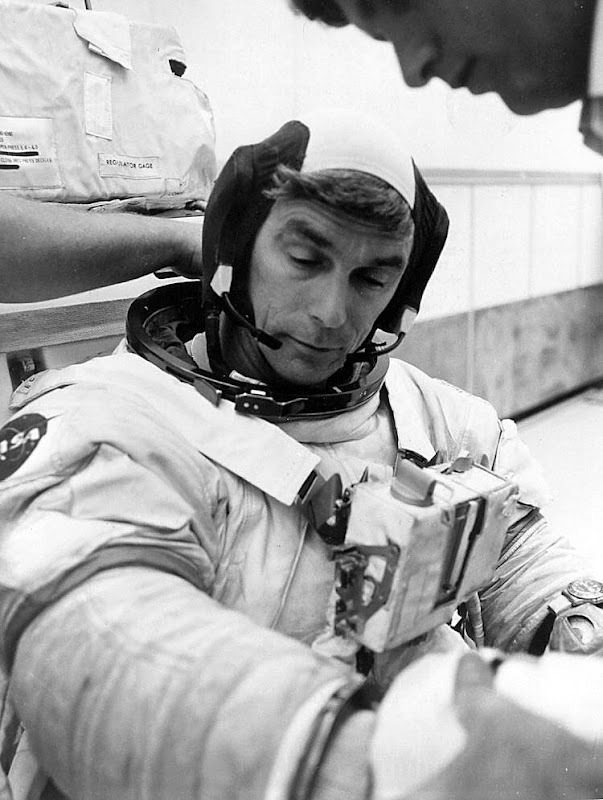 Here is a photo of Eugene Cernan during Apollo 17 training and he is wearing a Rolex GMT on velcro outside his suit. What is a NASA astronaut doing wearing a Rolex GMT on the outside of his space suit when Omega is the official NASA watch? I have no idea? So I want to by crystal clear that I have no bias and I am only interested in the truth, so much so, I plan to write a super detailed article that covers every watch in space. Kevin, you say "I have documentation to the contrary." You go on to say "Correspondence from the Astronaut office, under Deke Slayton's signature, details what happened. According to him, 4 Speedies were procured..."
Could you please provide links to all the documents you cite or the specific source of your cited documents that your refer to when you say "I have documentation to the contrary? I ask about your sources not because I challenge or dispute anything you say, I would simply like to review the specific documents you cite. Thanking you in advance for your kind assistance in this matter. Jake, the watch-related documents I have were all taken from either the NASA JSC archives now at the University of Houston-Clear Lake, or from the MSC/JSC materials transferred to the National Archives in Ft. Worth. I came across them in doing extensive research on spacesuits. Unfortunately, that means they're intermingled with all of that material. I did locate the one by Slayton from which I quoted extensively in my previous post. If you'd like, I can scan it and e-mail you the pdf. I also have the NAS9-3535 contract that mentions the requirement for a watch to be developed, but that's a big document and a point not really in dispute. I could also send you the TWX that mentions deleting that provision from HSD's contract if you care, but again not really in dispute. Somewhere, I have the test results from the actual (earlier) CSD testing of various watch brands, but I was unable to locate it after a bit of digging last night. I'll see what I can do to find it, but as I said, all my quotes came from the document I did unearth and I'll be happy to share it. How about I'll send you my document if you send me the name of your source? I think my only point of disagreement with you is related to the "official" status of the Omega watch and Omega being paid to be that. As you may know, as a government agency, NASA can't endorse, or be paid to endorse, anything. This isn't the NFL. It never claims anything is it's "official" whatever and it maintains strict standards on how such claims are made and how its logo is used to suggest its endorsement. In the case of the watches (no pun intended), NASA needed to find a timepiece that could work in space, so it put it through the same paces as anything else going into the spacecraft and on the EMU. Sure, as your article and others point out, this process was haphazard and done as an afterthought in the early days, but when it came to using equipment on EVAs and on the moon, they had to make sure the watch met standards. The Speedmaster did this, it was popular at the time, the astronauts liked it, so they stuck with it. Obviously the "official" status of the watch was a little lax because, as you've pointed out, other brands made it into space on at least one occasion. How would that happen if Omega was paying good money to be the "official" watch of NASA? Perhaps the story of Omega paying NASA is something else, like having to pay some sort of royalty after it started marketing itself as the "Moon watch"? But I have seen no evidence to suggest the company had any influence on the selection process. I am very curious to at least know who your source is. But as someone who has done quite a few interviews with a lot of NASA pioneers, I should caution that any claims made in such interviews should always be corroborated with documents, or else they're only good for stories... or debates like this.